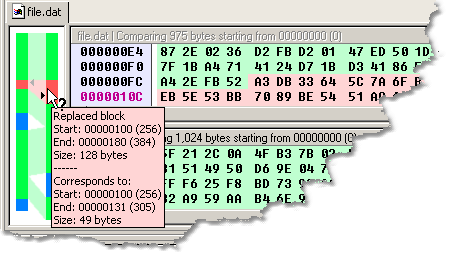 The comparison map shows the positions of the blocks in the files being compared, and how they correspond. Matching (identical) blocks are shown in green. Unique (inserted) blocks reside between two matching blocks and are shown in blue. The corresponding matching blocks in the other file reside side by side. Differing (replaced) blocks are shown in red. Differing blocks reside between matching blocks, and the other file also has some data between the corresponding matching blocks. Left-click a file in the map to jump to the corresponding position. Right-clicking displays the comparision map menu. You can change the assigned colors by using the Tools / Layout and Colors command.